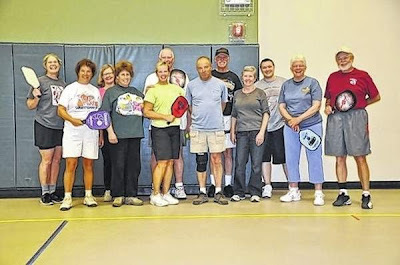 Jonesville, NC: The Yadkin Valley Senior Center is hosting Pickle-Ball classes. The center, located next to Lila Swaim Memorial Park, provides the equipment. There is no charge to play. Players use the crafts/exercise room on the right side of the building as a court. Pickle-Ball was created in 1965 by two men, Congressman Joel Pritchard and Bill Bell, in Washington State. The two men had returned from playing golf and found their families sitting around with nothing to do. Pritchard’s home had an old badminton court so the two men looked for equipment. The rackets were damaged but they improvised by using four wooden paddles resembling large Ping-Pong paddles. The net was lowered from badminton’s 60 inch height to 34 inches, and a perforated plastic ball used. The ball catches the air and slows down, meaning players can keep a volley going much longer than in tennis. Pritchard’s family cocker spaniel, Pickles, was the namesake. Today the sport draws young and old alike, as was its intention. Ten percent of the more than 75,000 players nationwide are physically active seniors. Seniors are more than able to play because the game is meant for every age of family, from young children to older members. 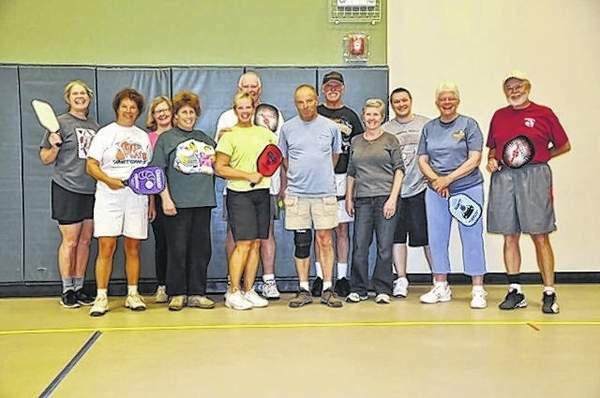 There is even an organization that regulates the sport: the USAPA, USA Pickle-Ball Association. Anyone interested should contact the Yadkin Valley Senior Center at 336-526-1087 for more information. Official rules and a detailed history of the sport can be found at www.usapa.org. To contact Taylor Pardue call 336-835-1513 ext. 15, or email him at tpardue@civitasmedia.com.